Opening hours: 8 a. m. – 5 p. m.
Masses: 5 p. m., Sunday 10 a. m.
The South-Bohemian pilgrimage site of Klokoty is situated in the western part of Tábor; it can be reached on foot from the city centre over the Tismenický stream valley and along a path lined with lime-trees. A little castle owned by Vítek of Klokoty and a small church used to stand in this location as early as in the 13th century. The first written record on the church itself originated from 1361; the church was mentioned in connection with local vicar Bolech. The Klokoty premises, situated on a promontory over the river Lužnice, got their name either according to an old Czech word denoting flowing water in a river or, as mentioned in other materials, after bladdernut shrubs that used to be plentiful in the past. There is a record from 1389 on the patrocinium – consecration of the church on the day of the Assumption of Our Lady. A legend has it that at that time Madonna, taking the look of a beautiful girl, appeared in front of little cowboys first and subsequently in front of other local people; she taught them about the God and then was raised to the heaven by angels before people's very eyes. This event was painted by an unknown painter from Sezimovo Ústí and local people built a little chapel over the Dobrá Voda spring to place the picture there. Pilgrims started coming to this site and that was why a small church was erected. It is said that it was located 1000 steps easterly from the chapel so that the spring would not be damaged because the spring had always been considered to have magic effect. Klokoty did not avoid the Hussite wars; the chapel was damaged and about 50 members of the Adamite sect were burned to death near the local vicarage in 1421. The first message about the construction of a new chapel on top of the original ruins dated back to 1520 when, as a legend has it, the unharmed original picture of Our Lady was discovered. Towards the end of the 17th century Tábor sold Klokoty to the Order of Benedictines of Montseratt and their superior Didaco di Convero launched large-scale renovation which resulted in the current look of the site. The church nave and two side chapels were built, the church was enclosed with roofed passages and chapels in corners and in the southern part a residence was built. Even though Benedictines were removed from the site during the construction process and the monastery ended up in the hands of the Tábor municipality, the construction could continue due to donations from Tábor burghers and members of significant noble families. The site has always been connected with pilgrimages to Our Lady, the main pilgrimage is held annually on Saturday closest to the day of the Assumption of Our Lady (15 August). is the central point of the pilgrimage site. 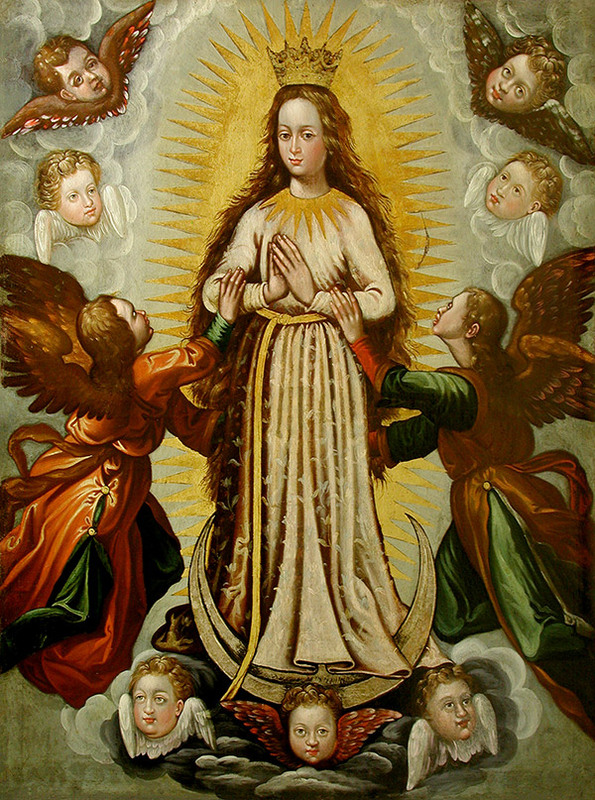 The early-Baroque look of the sacred picture of Our Lady of Klokoty originated from the studio of Prague painter Johann Andreas Burger from 1636. In 1743 the picture was fixed to the silver altar made by jeweller František Seitz who also made the tombstone of St. John of Nepomuk in the St. Vitus, Vojtěch and Wenceslaus' Cathedral in Prague. As far as the style of the picture is concerned, it ranks among so called “corn-ear Madonnas“ named after corn ears, in this case twigs, scattered all over Our Lady's vestments. We can encounter this type of picture inspired by the silver statue of Madonna of Milan from the turn of the 14th century at more sites in Central Europe. There is no information about the look of the original simple gothic church. After its renovation in the early 18th century the layout of the church was shaped like a double-arm cross. A church nave extended the originally round foundations of the church; oratories were built over the original chapels next to the presbytery and more chapels were added on the sides of the nave. Archived materials document that the construction works were controlled by a builder from the nearby village of Ratibořské Hory. The ceiling over the main altar features a vaulted dome richly decorated with stucco and pictures showing the Birth of Our Lord, the Flight into Egypt, the Wedding at Cana and other events inspired by the Bible. Captions under pictures hide a chronogram specifying the time when the building was erected (1707–1708). It is possible to enter side chapels from the presbytery; side chapels are used as the sacristies nowadays; oratories above them were donated by the families of Hodějovský of Hodějov and Bechyňs of Lažany in 1708–1709. The presbytery and the nave are separated with an arch decorated with the Pietà; above the statue you can see the coat of arms of the church benefactor – the town of Tábor. Side altars of St. Barbora and St. Dorothy next to the arch were funded by the family of Deyms of Střítěž. The Lobkowicz family had the large side chapel of St. Joseph built and the Schwarzenbergs funded the southern side chapel of St. Wenceslaus. The altar in this chapel was decorated with statues of St. Cyril and Methodius, St. Agnes of Bohemia and St. Ludmila in the early 20th century. The nave ceiling – decorated with pictures from 1892 showing the Annunciation, the Assumption and the Visitation – is surprisingly flat as compared to the ceilings in the side chapels. The organ loft, the pulpit and the pews date from 1720. In the front section of the nave one cannot miss a large tombstone which covers a vault established in 1746 as a burial site for local priests. The church premises are surrounded with roofed passages opened towards the inside of the premises, also called arcaded walks. In the corners of these passages there are chapels topped with onion domes similar to the one roofing the church; the premises feature a total of ten towers. The chapels in the arcaded walks are consecrated to St. Anna, St. Laurent, St. Vojtěch and the Virgin Mary of Rosary. The chapels are decorated with altar pictures showing the life of each of the saints; walls boast rich stucco decorations like the side chapels in the church. Large lunette oil paintings displayed in the western passage originate from the time when the pilgrimage site was built. In their central section there are pictures showing moments from Christ's life; the left section features stories from the Old Testament and the right section deals with events from Jan Nepomucký's life. A little niche chapel situated in this part of the monastery is dedicated to Jan Nepomucký. There is also the entrance to the local cemetery on this side of the monastery. Chapels as well as roofed passages built at the expense of Tábor burghers in the 1720s and 1730s can serve as a shadowy refuge offering a charming view of the rose garden. A residential building was built on the southern side in 1743; local priests have used the house as their home since that time. The impression of Klokoty is amplified by the sound of 10 bells. The oldest one was cast in 1508, the second oldest one a hundred years later; the others were added in 1980. One of the old bells was consecrated to St. Eugene de Mazenod the founder of the order of the Missionary Oblates of Mary Immaculate. The modern history of the Klokoty monastery has been linked with the congregation of the Missionary Oblates of Mary Immaculate since 1994. The word oblate is of Latin origin and is interpreted as the one who was sacrificed to the God. The main mission of the Congregation is, as per Eugen de Mazenod's (1782–1861) wish, to stay among the most lonely people and to show Christ to them by simple presence and by practical help. 5000 members of the order have been helping in 70 countries nowadays. Inspired by Jesus who did not come to be served but came to serve, Oblates' missions have various forms, but always pay special attention to protection of children and weak and vulnerable people; beside that they also arrange dialogues among different religious beliefs. Oblates' activities in international organizations and in the United Nations are also very significant; they promote justice and put effort into the creation of such conditions which would make it possible that the voice of the poor be heard in places where decisions about their lives are made. Locally, oblates administer the Klokoty parish which also includes the management of the renovation process of the pilgrimage premises in such a way that the site would retain its typical features for future generations. The Klokoty Way of the Cross can be a pleasant walk as well as a useful pilgrimage. The Way, as it looks now, dates from 1866. It comprises 14 stations with polychrome pictures made by Tábor painter Antonín Hála. The Way of the Cross starts at the eastern entrance to the pilgrimage premises, runs along the lime-tree alley to the little chapel of St. John of Nepomuk and unusually turns back towards the church. From there it continues along the cemetery to the edge of the forest and via a rockery with a cross showing the Calvary (probably from the late 17th century) the path brings a pilgrim along a young lime-tree alley to the chapel of Dobrá Voda, the site of the original Apparition of Our Lady. The chapel which dates from 1730 was built in the same architectural style as the Klokoty monastery.